It’s what the rest of the men’s field is feeling today based on the uncharacteristic performance of Rafael Nadal on clay this season. Nadal has been not at his best on his favorite surface. It’s not just the losses to David Ferrer and Nicolas Almagro at Monaco and Barcelona respectively, or that emphatic defeat to Novak Djokovic in the Rome final last week. It’s the struggle to win matches. He did win at Madrid, but a lot of that had to do with his opponent Kei Nishikori’s getting hurt. The Japanese was forced to retire hurt in the third set after injuring his hip during the second set (he had won the first set). Routine straight sets victories on clay have been few and far between for the Spaniard this year. However, this is still the French Open, which Nadal has won eight times (including the last four years) and has lost just one match in his career (59-1 record). It still is going to require a massive effort to win three sets off of the greatest clay court player ever in Paris. Will Nadal continue his dominance at Roland Garros? Is he vulnerable? Let’s take a look at the men’s draw to see if there are any answers. If Nadal is suffering from a lack of confidence, as he stated a few weeks ago, then he has better get it back in a hurry. The eight-time winner has been handed quite a tough draw. It could start as early as the second round against the fast-rising, big-hitting, 20-year old Austrian Dominic Thiem. And in the fourth round, he could face either the veteran Tommy Haas or fellow Spaniard Nicolas Almagro (who beat Nadal in Barcelona for his first career victory against his countryman). The other top seed in this section of the draw is another Spaniard, last year’s finalist David Ferrer. The always steady Ferrer, who is seeded fifth at Roland Garros, took out Nadal at Monte Carlo and should always be taken seriously. His path to the quarterfinals look pretty routine. Keep an eye on the 11th seed, Grigor Dimitrov, who could meet Ferrer in the fourth round – provided the Bulgarian can get past Ivo Karlovic in the first round. This will be Wawrinka’s first Grand Slam tournament as a Grand Slam winner and top five player. The expectations (not to mention the pressure) will be far different than it was before the Australian Open this year. Given his performance so far this year, the Swiss will be a tough read. He’s won the Aussie Open and Monte Carlo. He has wins over Nadal, Novak Djokovic, and Roger Federer. But he didn’t look good at Indian Wells and Miami. Just when people were talking up his French Open chances after winning Monte Carlo, he followed it up with early exits in Madrid and Rome. There are plenty of players in this part of the draw who can take advantage of any Wawrinka slip up. To get the quarters, he may have to get past players such as Feliciano Lopez, Gaels Monfils, or the unpredictable Fabio Fognini. If that wasn’t enough, Wawrinka had the misfortune of drawing Andy Murray in his quarter. Murray looked close to his old self at Rome, falling to Nadal in a very close quarterfinal encounter. Murray actually looks to have an easier path to the quarterfinals than Wawrinka. The Brit has Richard Gasquet as the other top seed in his half of the section, and the Frenchman has never done well in front of the home crowd. Roger Federer has had a fine bounce-back season thus far. But his French Open preparation was “interrupted” when his wife Mirka gave birth to twin boys (to go with the twin girls they had four years ago). After making to finals at Monte Carlo (losing to Wawrinka), Federer had to withdraw from Madrid and was beaten in his opening match in Rome. However, Federer insisted that he is ready and focus for the French, and perhaps the time off could be a blessing in disguise as he will be fresher for the two-week grind in Paris. The 17-time Slam winner has a kind draw and should be able to play his way into the tournament with little stress. Mikhail Youzhny and Ernests Gulbis would be the top seeds he would possibly meet before the quarterfinals, and his record against both is a combined 18-1 (16-0 against the 15th-seeded Youzhny). The other top seed is Tomas Berdych. Berdych has had some success against Federer in his career, but the sixth seed has never done well in Paris. The big Czech has lost in the first round of the French in three of the past five years. Another early exit should not come as a shock. Any concerns over Djokovic’s right wrist was put to rest when he won at Rome last week, including a convincing victory over Nadal in the final. Now, many are considering him – not Nadal – the man to beat in Paris. Things should get interesting for the Serb, after the first two rounds. He could face Marin Cilic (who’s played well so far this year) in the third round. The fourth round could see another encounter with Frenchman Jo-Wilfried Tsonga, who usually plays inspired tennis in front of the home crowd and who also came close to eliminating Djokovic in Paris a few years ago. And should he reach the quarterfinals as expected, his possible opponent could be either the eighth seed Milos Raonic (who came close to beating Djokovic in Rome) or the in-form but oft-injured Kei Nishikori (who is seeded a career-best ninth). Djokovic better hope that his right wrist does not flare up on him again, because he really has his work cut out for him. Wawrinka’s upper body is strong enough where his one-hand backhand with withstand the assault of the Nadal forehand on clay, unlike his countryman Federer. 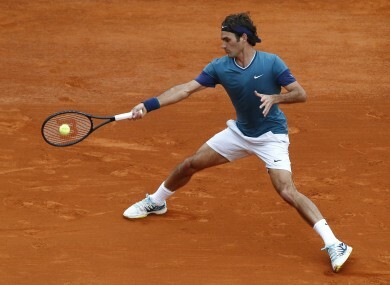 However, the clay should still generate those high bounces from Nadal’s top spin to trouble the Swiss. Nadal will also be eager to avenge his defeat in the Australian Open final. Least anyone forget, that was Wawrinka’s first win versus Nadal. Before that, he had not taken so much as a set in 11 previous meetings. This should be a long physical affair between two of the more physical players on the tour, but Nadal gets the edge on clay. Three years ago (during his magical 2011 season), Novak Djokovic looked on his way to his first French Open title before losing to Federer in the semifinals. Will the Djoker survive Federer this time around? Federer is 2-1 against Djokovic in 2014, but the Serb was bothered by his sore wrist during their most recent match in Monte Carlo and had to withdraw from Madrid the following week. Should Djokovic’s wrist hold up to this point, he should be able to win the majority of those long rallies against the Swiss. Federer, needs to be aggressive for most of this match, but at times he can resort to being passive – particularly on the big points. Those “big points” will be what gives Djokovic the edge in this one. Speaking of Djokovic’s magical 2011 season, that was the year when Nadal seemingly had no answers for the Serbian. In fact, had Djokovic beaten Federer to face Nadal in the French Open that year many felt that it would have been Nole lifting La Coupe de Mousquetaires (or The Musketeer’s Cup in English). Well, ever since the U.S. Open final last year, the rivalry has once again swung back into Djokovic’s favor. Nole has won their last four meetings since Flushings, losing just one set. Djokovic is the only player capable of defeating Nadal on clay, having come oh so close in the semifinals last year. He will get the job done this time, to end Nadal’s reign in Paris. Who will be the 2014 French Open men's singles champion? Will Rafael Nadal Win Another Grand Slam After Losing at 2015 US Open?